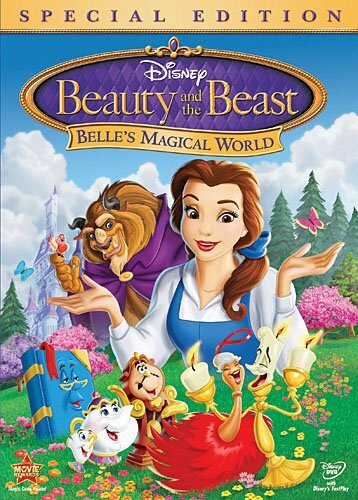 Beauty and the Beast: Belle's Magical World is like four half-hour TV show episodes combined into a feature length film. In the movie, each of these four stories is supposed to be like a story in a storybook, as each episode begins with a page in a book displaying the title of the episode, and then the pages turn to start the episode. It's a nice touch that I really liked. The first episode is called "The Perfect Word", and involves Belle and The Beast getting into an argument and then neither one of them wanting to apologize. Also, Lumiere has a bit of an argument with a new character, Chandeleria, and like Belle and The Beast neither will apologize to the other. So some of the castle staff takes it upon themselves to get Belle and The Beast back together by tricking Belle into thinking The Beast has apologized so that she would apologize to her, but of course the whole thing backfires. Don't fret though, because it all works out in the end. The next episode is called Fifi's Folly, and focuses on the characters Fifi the Featherduster and Lumiere. Their five-year anniversary of their first date is coming up, and Lumiere tries to set up a worthy anniversary date with Belle's help, but Fifi sees the two of them together and gets the wrong idea, thinking that Belle stole Lumiere away from her. Fifi, in her jealousy, go so far as to try killing Lumiere and Belle by sabatoging a slay, which I think went a bit too far... or even WAY to far! For a children's show?! Next up is "Mrs. Potts' Party" where the teapot Mrs. Potts is feeling all depressed because of the gloomy weather, so Belle and friends try to throw her a surprise party to cheer her up. Problem is, Lumiere and Cogsworth each have different ideas about the party, and they can neither work together nor compromise which ends up completely destroying the party. New characters in this episode includes the chef which is a stove, his two helpers which are oven mitts, one red and one blue, and then one of those things that whips up batter. Finally we have "The Broken Wing", where a little bird breaks its wing and falls into Belle's room. This causes Belle's lunch date with The Beast to slip her mind, which of course angers him. Is there anything that doesn't anger this guy? Oh yeah, and he doesn't like birds either. Sheesh, this guy.... Also in this episode, Cogsworth things that the castle staff doesn't respect him anymore, so he becomes a jerk and tries to force everyone to respect him, which of course doesn't work. This DVD contains a few bonus features, but the main one is the half-hour live-action/animated show featuring Belle called Sing Me A Story. There was one of these on Beauty and the Beast: The Enchanted Christmas Special Edition that was about not giving up just because something was difficult. This episode is about how being a good person is better than being good looking. It's a decent educational show. Bonus Episode: Disney's Sing Me A Story With Belle: "What's Inside Counts"